A NON-Disposable System For Years of Beautiful Service. You've Created the perfect atmosphere with thousands of dollars in furnishings, decor, amenities and professionally trained servers for your establishment... why trust your hospitality to disposable, plastic complimentary cocktail service from your liquor supplier? Even more important... Why advertise a mismatched product to your customer's preference. The "Complimentary" bottle service products from your suppliers are created with "advertising objectives" as the priority over function, design durability and personalization for YOUR establishment. Why settle for "1 standard model", 1 color and no variety? 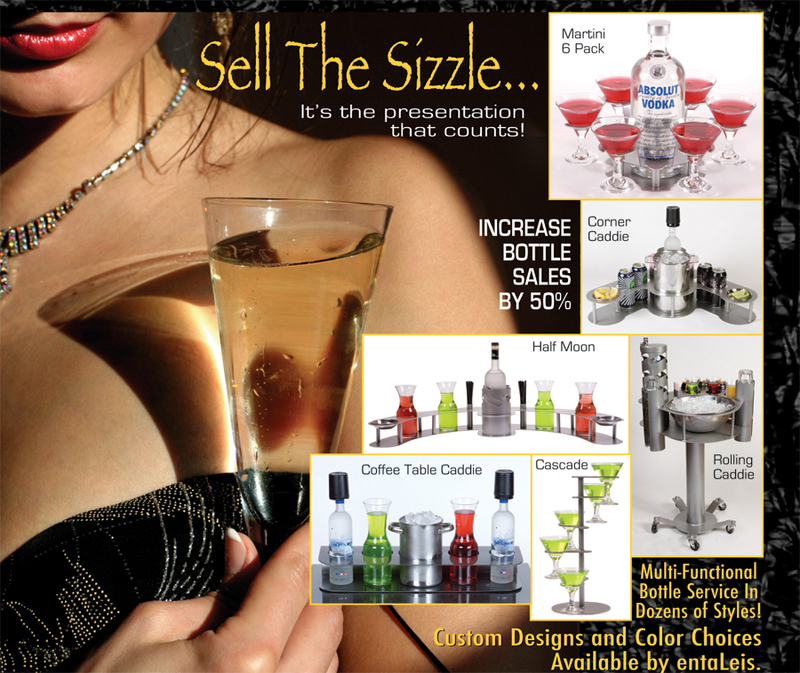 There is NO Comparison or Limits to the Image Created by entaLeis Bottle Service Products. Unique, Personality, Available In a myriad of striking Colors, Better Presentation Value, Nearly indestructible metal vs. Plastic. No Typical Plastic Fogging, Scratching, Cracking or Staining for an Indefinitely "NEW" Look in durable metal. The Possibilities are endless, including Color choices, logos and/or design applications with our FREE consultation service. Portable style caddies allow you to efficiently offer and promote bottle services within your venue without compromising your customer’s table space. Designs come in locking and non locking styles. Table Top Caddies create a well dressed and organized style to promote your services while enhancing your customer’s experience. Designs come in locking and non locking styles.